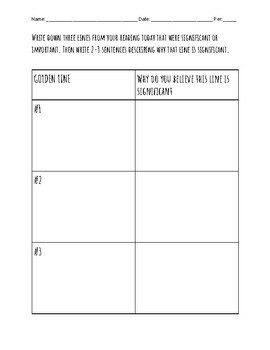 Need a last minute assignment for a reading activity OR an extended silent reading activity? 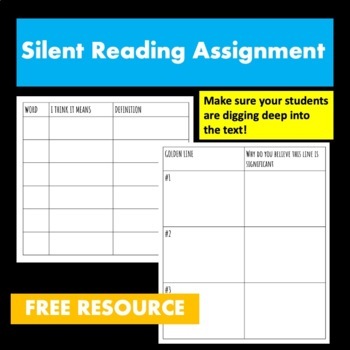 This assignment could be used as a class with a reading assignment for the day or it could easily be used as an extension to their daily silent reading. Just one page, this assignment has students pick out words they don't know and write down what they think they mean before looking it up (working on those context clues). And, students choose three lines from the text that are significant, or "golden lines" and describe why they are important.